Washington, DC – According to new U.S. Government data analyzed by the National U.S.- Arab Chamber of Commerce (NUSACC), exports of U.S. goods to the Middle East and North Africa (MENA) amounted to a “mixed bag” in 2017, with some countries increasing imports from the USA, while other countries saw U.S. imports fall. Among the major players in the region, Kuwait and Algeria occupied opposite ends of the trade spectrum: Kuwait experienced U.S. import growth of over 50 percent, while Algeria saw a drop in U.S. imports of more than 50 percent. The overall trend in the region was downward, with MENA’s biggest markets for U.S. goods – the United Arab Emirates and Saudi Arabia – each experiencing a drop of approximately 10 percent (totaling $4.12 billion in year-on-year losses). For both countries, this represents the largest one-year drop in memory. Coupled with losses of $1.81 billion in neighboring Qatar, these three countries alone shed the equivalent of over 35,000 U.S.-based jobs in 2017. U.S. goods exports to the MENA region sank for the third straight year, from $67.3 billion in 2015 to $64.1 billion in 2016 to $60.4 billion in 2017. This amounts to a drop of approximately six percent in the past year and a decrease of more than ten percent since 2015. Continuing Soft Oil Prices – Oil prices have been on the rise, but they are still lagging behind historical levels, thanks in part to technological advances that make hydraulic fracturing (“fracking”) and renewable energy more affordable. For major oil producing nations in the Arab world, that translates into less funding available for big ticket projects and discretionary spending. The Strength of the U.S. Dollar – The dollar’s strength increased 28 percent between 2014 and 2016. While the dollar has weakened somewhat since President Donald Trump took office, he has promised to ensure that the greenback gets “stronger and stronger.” A robust dollar makes it more difficult for U.S. exports to compete on price against other entities around the world, and this had a dampening effect on American exporters in 2017. ​​Regional Wars – Wars in Syria, Iraq, Yemen, Libya, and other parts of the region continue to sap resources from more productive priorities. Many of these expenditures have been unanticipated, creating a major strain on regional economies. Seven years into the Arab Spring, with proxy wars still raging in parts of the region, these conflicts are draining coffers in the Levant, North Africa, and the Arabian Gulf. Many of these expenditures have been for weapons, but additional funds are being spent to provide food, medicine, shelter, and schooling for refugees and displaced persons. ​The Rise of Iran and Disunity Within the GCC – Historically, the six Gulf Cooperation Council (GCC) nations have worked together very closely. But not in 2017, when quarreling over politics, counter-terrorism efforts, and Iran’s influence in the region has created major disruptions within the GCC. The Arabian Gulf countries are the destination for most U.S. exports to the region, and this infighting appears to be having a negative impact on U.S. jobs and commerce. The drop in the MENA region stands in contrast to other major markets, which increased during the 2016 – 2017 period. America’s top export destination, Canada, saw a rise of 5.87 percent. Other increases among major trading partners included Mexico (5.78 percent), China (12.77 percent), and Japan (7.05 percent). The top five destinations in MENA for U.S. goods remained largely unchanged from previous years, except for Kuwait and Qatar, which switched places in the rankings. The top five were as follows: United Arab Emirates ($20.01 billion), Saudi Arabia ($16.26 billion), Kuwait ($5.17 billion), Egypt ($3.98 billion), and Qatar ($3.12 billion). GCC countries accounted for 79 percent of U.S. goods exported to the Arab world in 2017, totaling $47.5 billion in sales. Together, the top two export destinations – the United Arab Emirates and the Kingdom of Saudi Arabia – accounted for 60 percent of total U.S. goods exported to the MENA region. While the “Top Five” MENA destinations remained largely unchanged from 2016, the “Second Five” saw some jockeying in the ranks. Morocco ($2.12 billion) surged to sixth place, followed by two other Free Trade Agreement (FTA) signatories, Oman ($2.10 billion) and Jordan ($1.96 billion). Rounding out the Top Ten were Lebanon ($1.25 billion) and Iraq ($1.20 billion). The GCC countries, with significant security requirements and major infrastructure projects, continue to drive U.S. exports to the region. Some of these nations are hosting signature events – like Expo 2020 in Dubai and the 2022 FIFA World Cup in Doha – that offer major opportunities for American exporters. Kuwait was the biggest beneficiary of this trend in 2017, registering a surge in U.S. exports of 56.78 percent. On the other side of the ledger, U.S. businesses are being hurt by intra-GCC quarrels that festered in 2017. The UAE and Saudi Arabia imported $4.12 billion less from U.S. exporters in 2017 than they did in 2016, representing a loss of nearly 25,000 American jobs (with $1 billion in U.S. exports translating into 5,967 American jobs). Nowhere was this trend more pronounced in the GCC than in Qatar, which is fighting an embargo imposed by some of its neighbors. 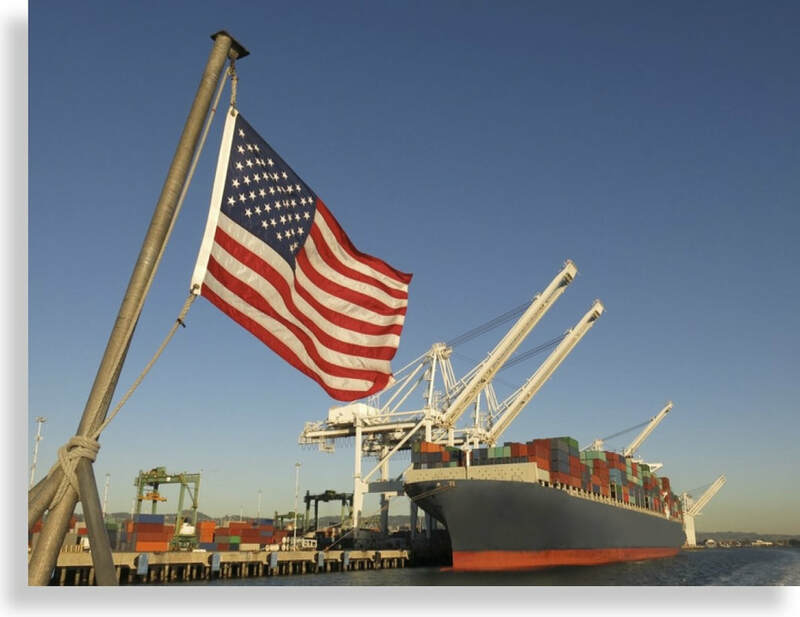 U.S. exports to that nation dropped 36.69 percent in 2017, representing a loss of 10,783 American jobs. 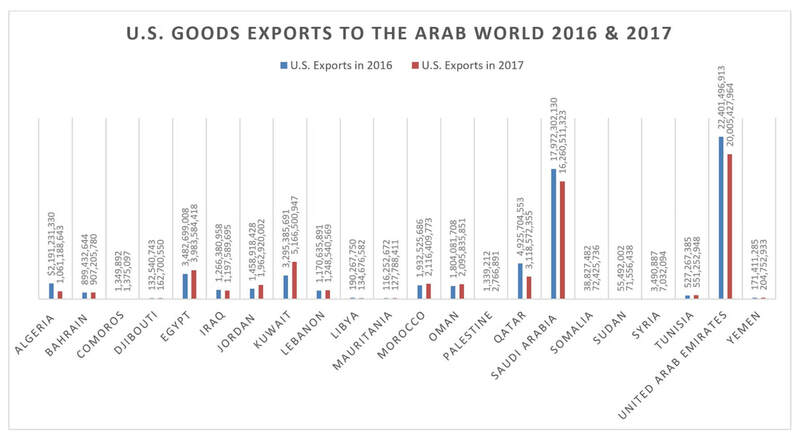 The four Arab nations that have signed Free Trade Agreements (FTAs) with the United States performed very well in 2017, with all four registering increases over 2016. Morocco led the group with $2.12 billion in imports from the USA, an increase of 9.52 percent. Oman was next, with $2.10 billion, an increase of 16.17 percent. Jordan was close behind, with $1.96 billion in U.S. purchases, translating into an increase of 34.55 percent. The gains of Bahrain – perhaps affected by the strife in the GCC – were more modest: Imports from the USA grew to $907,206, an increase of one percent. Egypt, the most populous country in the region, with an estimated 100 million inhabitants, staged a comeback in 2017. In 2016, that country boldly devalued the Egyptian pound against the dollar, resulting in fewer imports from the USA (a drop of $1.28 billion in 2016). In 2017, U.S. exports to Egypt rose by more than $500 million (14.38 percent growth) and foreign reserves swelled to $36.7 billion through the end of October, 2017. The year 2017 marked a strong showing by conflict areas that are working to restore their economies. While the dollar amounts may be statistically insignificant, the percentage growth is noteworthy: Palestine went up 106.61 percent, Syria went up 101.44 percent, and Somalia went up 86.53 percent. The U.S. lifted its sanctions on Sudan in 2017, and U.S. exports registered a healthy rise of 28.95 percent. Moving into cutting-edge sectors like these is a cornerstone of Saudi Arabia’s “Vision 2030” plan, which aims to diversify away from a hydrocarbons-based economy toward a knowledge-based economy. The plan has three main pillars: reaffirming Saudi Arabia as the “heart of the Arab and Islamic worlds”; establishing the Kingdom as a global investment powerhouse; transforming the country into a hub connecting the continents of Asia, Europe, and Africa. This vision was on display in October 2017, when Saudi Arabia staged the “Future Investment Initiative” (FII) in Riyadh to highlight direct investment opportunities in the Kingdom. The conference, which drew thousands of business leaders, including NUSACC, unveiled NEOM, a futuristic city spanning 10,000 square miles that will straddle Saudi Arabia, Jordan, and Egypt. The project will be supported by more than $500 billion in investment from the Saudi Government, including its sovereign wealth fund, as well as local and international investors. U.S.-based investment firms played a prominent role in the FII conference in Riyadh, reaffirming Saudi Arabia’s claim to establish a world-class presence in financial markets. That message has been reinforced by the Kingdom’s desire to hold an Initial Public Offering (IPO) for shares in Saudi Aramco, the largest oil company in the world. The proposed IPO is still a work in progress, but it is expected to be the largest share sale in history. For the second year in a row, the State of Washington clinched the top spot among U.S. States exporting to the Arab world. 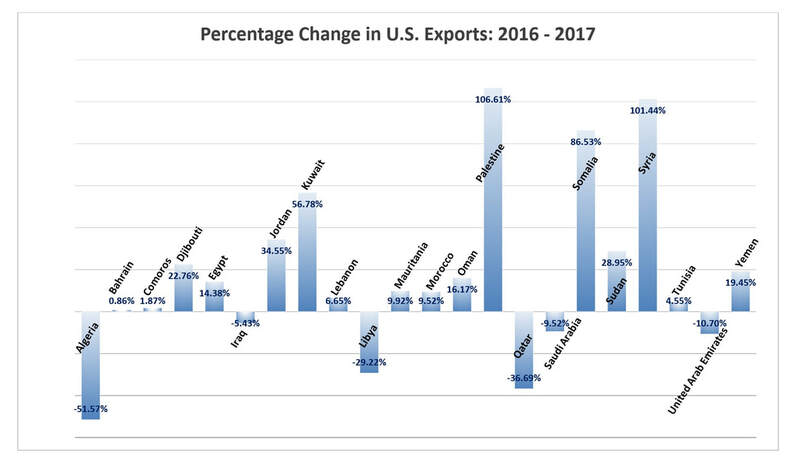 Washington generated $9.8 billion in exports in 2017, slightly down from 2016. Washington’s position as #1 came presumably on the strength of aircraft sales by Boeing, which delivered a record number of commercial airplanes in 2017. The top category of Washington’s exports was Transportation Equipment, which accounted for 93 percent of the State’s total exports to the Arab world. Number two on the list was the State of Texas, which has traditionally been the largest U.S. exporting State to the MENA region. Texas exported $8.7 billion to MENA in 2017, a 15.96 percent decrease from 2016 levels, with Transportation Equipment leading the way. Rounding out the top three exporting States was California, with $3.9 billion in exports, representing a drop of 20 percent from 2016 levels. California’s leading sector was Agricultural Products, accounting for 22.5 percent of that State’s goods exports to the Arab world.